Harley Cross wears black high top Converse “Chuck Taylor” All Stars in the film. Bobby helps his grandfather prune his pecan trees. As To Dance With the White Dog opens, it is 1966 and Sam Peek (Hume Cronyn) and his wife Cora (Jessica Tandy) are celebrating their fiftieth wedding anniversary in their rural Georgia town, where Sam owns a pecan grove. A lot of the town and their four sons and daughters are all present for this festive occasion. Although fiercely loyal to each other, they still joke about their relationship, with Cora saying that he will marry again when she is gone and someone else will be puttering around in her kitchen making biscuits, and Sam saying “I’d like to keep you and your biscuits.” Things continue on for seven more years, with Sam keeping active in the orchard even though the two of them have failing health. Then one evening, Cora has a heart attack and passes away, just after they had made plans to attend their college reunion. Sam has trouble dealing with his loss, and no amount of fussing by their grown children can console him. Bobby bikes over to his grandparents’ house to help out. Neelie (Esther Rolle), Cora’s long time helper and friend, and the daughters Kate (Christine Baranski) and Carrie (Amy Wright) try to keep watch over Mr. Sam, but he would rather be alone, and he refuses to alter his daily routine of checking the orchards. The only one who seems to understand is Sam’s grandson Bobby (Harley Cross), who would rather help his grandfather in the orchards than watch his younger siblings. One day a white dog appears at Sam’s door. At first Sam tries to shoo it away, but then he brings it in and adopts it. But the problem is no one else can see the dog, even though the daughters try all sort of schemes to see if it actually exists. This causes great worry to the younger Peek generation, who begin to think that Sam is becoming delusional. But when an infection in Sam’s hip causes him to pass out, the white dog reveals itself to Bobby and his parents, and eventually the rest of the family. Things come to a crisis, however, when Sam decides to go off to the reunion and insists on going alone.He doesn’t tell his family where he is going, but does confide in Bobby. Unfortunately, the trip is more than Sam can handle, and he becomes hopelessly lost. 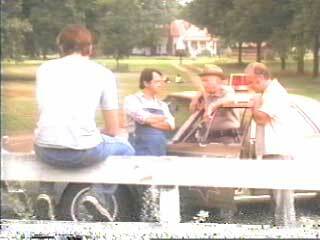 Luckily a farmer and his wife find him and get him back on the road to the reunion, but later he goes astray again. Meanwhile, his family starts to search for him, and eventually is successful in rescuing him after Bobby reveals where Sam was actually headed. Back at home, Sam reveals who the dog actually is, and prepares for his eventual death. The whole town is concerned when Sam is missing. To Dance With The White Dog is really a love story about the long term relationship of two extraordinarily committed people — a relationship so strong that it even survives after the death of one of them. Additionally, it is the final film that Jessica Tandy and Hume Cronyn made together. This ends up being a perfect casting, because the two had a similar relationship in real life, and so every nuance and gesture rings true. Even though Tandy appears in the film only for a brief time, and in a few flashbacks, her presence is felt throughout in the responses and reactions of Hume Cronyn. Cronyn gives us one his finest acting performances as we see him play Sam in his prime, coping with grief, dealing with his depression, trying to maintain his independence and dignity in the face of failing health, and eventually learning to live again and accept his fate. Harley Cross is excellent in his role as Bobby, their grandson, who is sometimes a confidant but also the voice of the new generation, not always understanding why his grandfather behaves the way he does. This is another fine film in the Hallmark Hall of Fame series, a fine adaption of the novel by Terry Kay. It is not often that a film is made that focuses on two elderly leads — On Golden Pond is one of the few other examples. So enjoy To Dance With The White Dog as message about life and as the culmination of the careers of two fine actors. 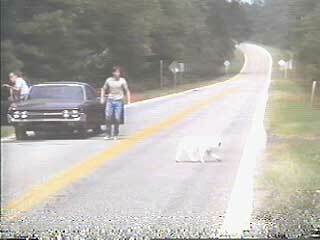 The white dog helps Bobby and the other family members find Sam. Bobby and Sam talk about the future. 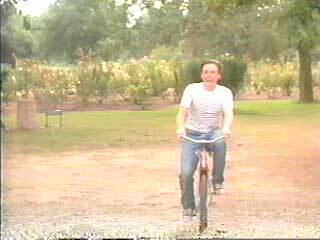 Harley Cross in his role as Bobby, wears black high top chucks throughout the film. 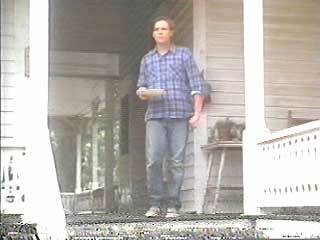 The best scene is where he is sitting on the porch talking with Sam. Bobby puts out food for the white dog. To Dance with the White Dog. (1993) Hume Cronyn, Jessica Tandy, Christine Baranski, Terry Beaver, Harley Cross, Esther Rolle, Frank Whaley. Directed by Glenn Jordan. Categories: Drama, Family.